The Rebel Sweetheart. 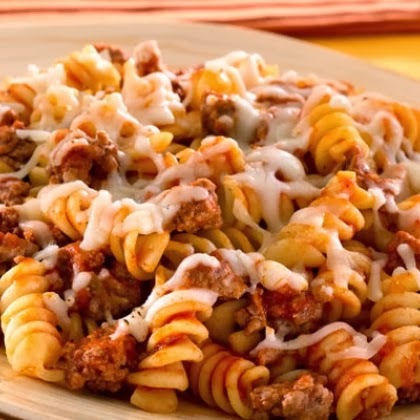 : Foodie Goodie | Beef & Rotini. I've always been fascinated with rotini pasta ever since I was a kid. They're literally pasta 'with a twist' as they come in a corkscrew, spiral shape. They even have colored variants, such as the Barilla Tri-Color Rotini, which were often given to us as gifts by relatives who used to work in Italy. And after seeing how much love my Spaghetti Aglio Oglio received from you, my dear readers, I decided to share another pasta recipe for this week's edition of Foodie Goodie. Like the Aglio Oglio, this dish uses the simplest ingredients and takes just about half an hour to cook. 1. In a skillet, cook ground beef until brown. Drain the excess oil. 2. In the same skillet, stir in the pasta sauces and 1 cup of water. Bring to a boil over high heat. 3. Stir in uncooked rotini and return to a boil. 4. Reduce heat to medium and cook uncovered, stirring occasionally (about 10 minutes or until rotini is al dente). 5. Remove from heat then sprinkle with cheese. 6. Cover and let stand for five minutes, or until the cheese has melted. thanks for sharing this recipe.will definitely attempt to do this recipe soon..
Hum-never thought about making it this way--I would have browned meat then added it to a saucepan of the sauce and cooked. Cooked the pasta separately then poured the now meat sauce over the pasta-then added cheese if any. I may just try this method next time. this should be easy to cook and I might have a try on it, thansk for sharing. A great easy recipe that kids will like!! Thanks for sharing. I bet my little one will eat this. I think the Mozzarella was a great addition for this. It looks delicious. I think this is one pasta that I'm gonna love as the beef would really add a lot of taste and substance to the pasta. I'm just about to make dinner and thought of spaghetti! This is a better idea though! wow! will try this recipe,.. thanks for the info. that looks tempting! simple, fast and easy! love it!